Photosmile CroydonHere at PhotoSmile in Croydon, we’re passionate not only about photography, but about creating breathtaking art, and that’s what makes us different. At PhotoSmile, we offer a wide range of photography, editing, and framing services to suit all requirements and all budgets. If you’re looking for a comprehensive photo service in Croydon, you’ve come to the right place. We’re not ‘just photographers’. We’re not ‘just a printing shop’. Instead, we’re a unique hybrid; an ‘all-in-one’ shop for all your photography needs.We believe that everyone should be able to show off and highlight their most treasured memories, which is why our prices are, and always will be, very competitive. 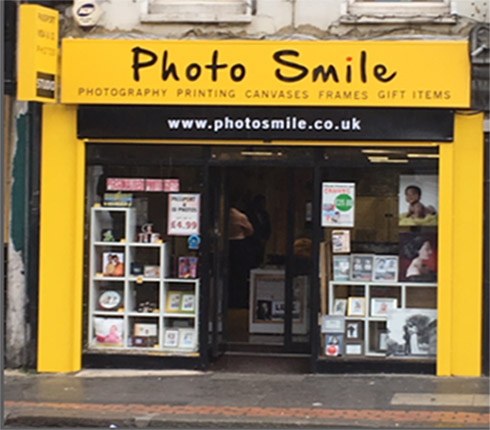 We offer some of the most affordable prints and photography in town, so pop in to our store in Croydon, and see how we can help you create your masterpiece. This includes personalised collages, customised wall art, and bespoke digital painting that helps to transform your favourite pictures into true works of art. Ideal to decorate your home, or give as gifts this Christmas. This includes studio photography for babies, families, individuals, and corporate shots, wedding and event photography, and product and marketing photography. We take on-site photos at our PhotoSmile studio, providing a professional and friendly environment. We have high quality frames in a wide variety of sizes and materials, to suit any image and any wall space; or why not work with us to create your own bespoke frames to meet specific requirements? Have an extra large or odd-sized photo? We can handle it! This includes UK passports, international passports, baby passports, and travel visas. We understand that passport photo regulations vary by country, and we’ll adhere to the strict rules of the country in question when taking your passport photos. This includes personalised mugs, bespoke cards, and a whole host of customised gifts which make the perfect present for a friend, family member, or loved one. It’s a fantastic way to show off your favourite pictures, and transform them into amazing items. This includes prints from phones, prints from social media, and creating beautiful photo books filled with your favourite memories. Our photo books also make excellent, heartfelt gifts to share with friends and family for special occasions.